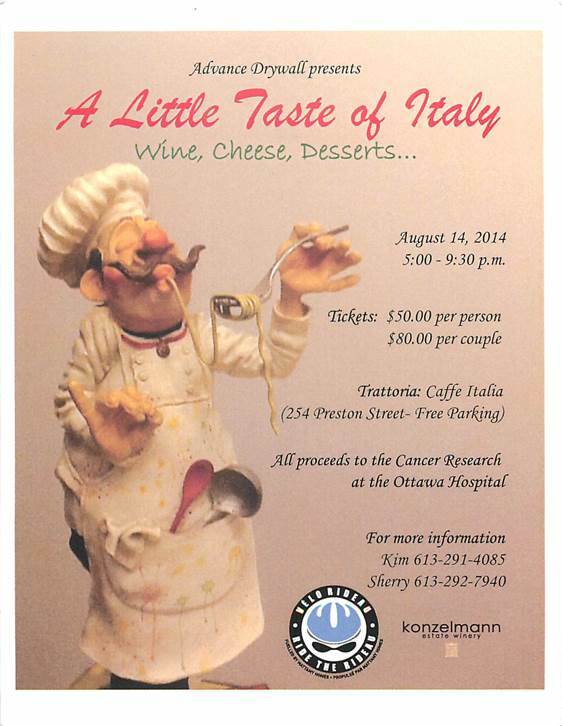 Advance Drywall is coordinating “A Little Taste of Italy” to raise Ride the Rideau funds. Tickets are $50.00 each or $80.00 per couple. Please call Kim at (613) 291 4085, Sherry at (613) 292 7940. Appetizers: Deep fried olives, pizza squares, veggies & dips, cheese, grapes, meatballs, calamari, antipasto….etc. A $150.00 gift certificate from Davidson Jewellers as a door prize.